I participated in the latest round of the Pillow Talk Swap on flickr. The deadline to mail our pillows was November 1st. 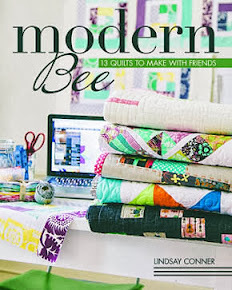 After stalking my secret partner on his/her blog, through his/her flickr projects and favorites I put together this stack of fabrics I thought he/she would like. Sorry for all the he/she stuff. It's a secret you see. The fabric sat around awhile, marinating, waiting to become something. Narrowing it down to one idea is hard. There are so many possibilities, so many things you could do. 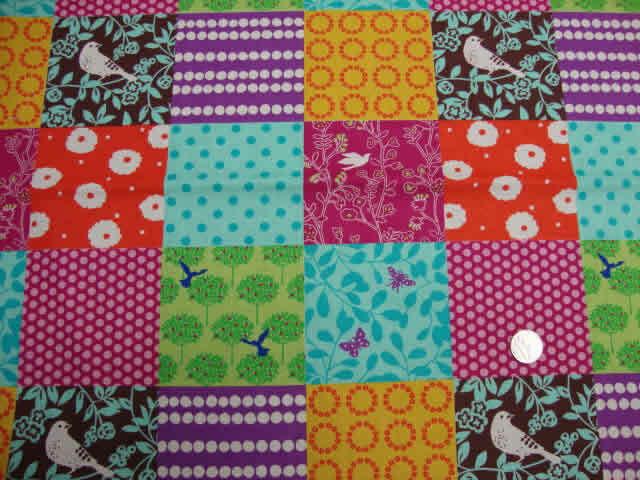 One of the fabrics is a cheater print and I started thinking, what if I cut those squares apart and treated it as separate fabrics? 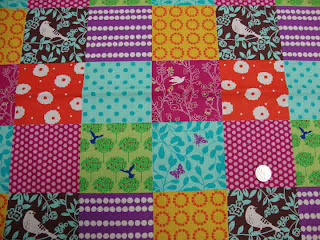 I remembered how much I loved Erin's scrappy Swoon block. 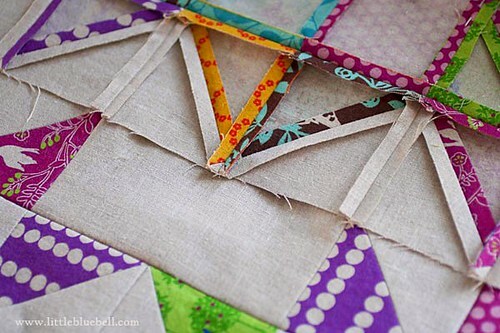 If I made one Swoon block a little smaller, it would be a great pillow. I liked the idea of it, but I wasn't sure how it would look. My friend Jaye says, "make visual decisions visually". So I drafted the block in EQ and colored it with a similar color palette. I LOVED it. 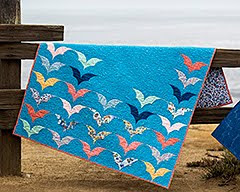 I bought the pattern Swoon by Camille Roskelley and started piecing the blocks. I made some changes as I went. For a scrappy look, I broke up the big rectangles into squares. 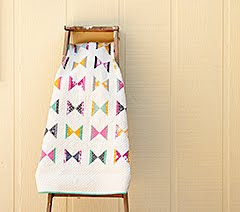 The cheater print and linen were so great together I decided to not use any of the other fabrics. 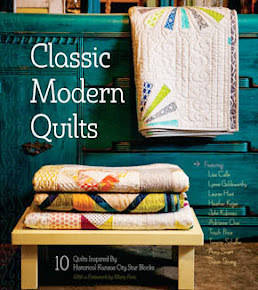 I also changed the center square from a colored block to plain linen one. Slowly I'm learning to listen to my instincts as I go. Pressing the seams open helped match up all those points. I had a few extra blocks and I added them to the back. Now my pillow is on it's way to it's new home. I hope my partner likes it as much as I do. 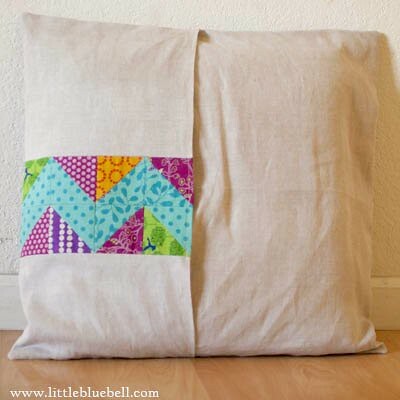 I am going to make a pillow one of these days I tell ya! Yours is really pretty Adrianne...adore all the shades of purple within it. One lucky partner gets one FABULOUS pillow!!!!!! WOW! I really loved reading about you process, great post! Thumbs up on the pillow! Definitely like the fabric choices. Beautiful! I even pinned it on pinterest! He/she is one lucky swap partner! 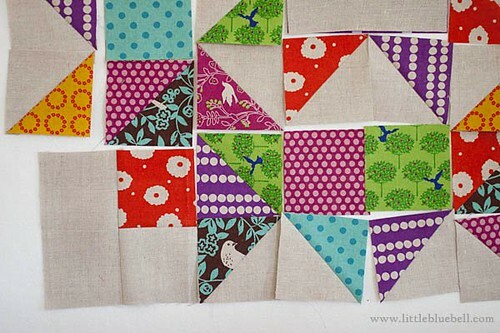 I'm making a scrap quilt with strips and throwing away the small squars, I should keep them to make throw pillows! Oh, I really, really love this pillow. It's gorgeous! It's beautiful, Adrianne! 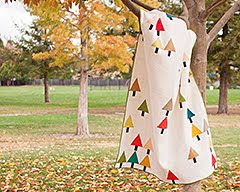 Lovely fabric choice and the pattern is great!! 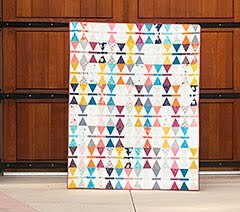 I love this scrappy Swoon! Hope to try it myself one day soon. Very nice!! Can I ask how big your pillow cover is & how big your squares are? 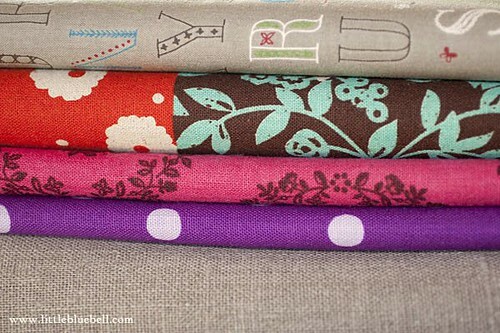 I bought the Swoon pattern last week & want to make it to fit a 20" pillow form but am horrible at math! I mean really horrible. It's sad. Thanks Adrianne, I love it so much - perfect! 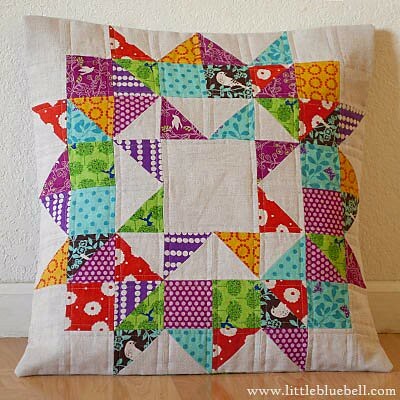 Gorgeous pillow - love the echino fabircs! !